It goes without question that cleaning the floor, and especially carpets, is among the most tasking household chores. However, it becomes a lot easier and less time consuming to eliminate dirt and grime from carpets if you use a great quality carpet extractor. 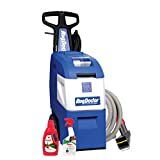 Otherwise known as steam carpet cleaners, carpet extractors utilize unique thick steam jets at low pressure to help clear stains, dirt and pet dander from carpeted floors in a more efficient and hassle-free way compared to accessories like vacuum cleaners’ performance. But then, it becomes a challenge for one to tell the best carpet extractor models that serve your needs apart, especially first-timers. Of course, you do not want a poor quality product that, besides its low standard of performance, will last a few days. You also need something that is not complicated in its operation and certainly delivers excellent results. For the foregoing benefits and more value, see the following top 10 best carpet extractors in 2019 to discover your favorite model that best meets your floor cleaning demands. This 12-galon carpet extractor is one of the best professional performance models that are easy to carry. Featuring finest performance internal components, this USA made extractor has a wonderful reliability record. Its external heater provides a consistent 210-degree steam flow to deliver a virtually matchless carpet dirt extraction performance. This unique Heat n Run heater offers several advantages over the competition. For instance, utilizing a securely mounted external heater significantly improves the life of the unit’s internal components since they are not exposed to high temperatures. Among other highlights is that this carpet extractor includes a handy mesh drawstring bag to help keep the hose assembly well organized. Any expert carpet cleaner who needs a great performance carpet extractor will appreciate that this EDIC Galaxy Commercial-Grade model deserves a rank among the best. It is an excellent efficiency machine that features a cutting edge design, to begin with. Besides elegance, it boasts innovative technology features that recommend it as a deal worth the cost. Among its features: a 12-gallon solution tank and 11-gallon recovery tank; dual 2-stage motors; and a 25-inch vacuum and solution hose assembly. It also comes with a spacious drawstring quality mesh bag for keeping the hose assembly securely. 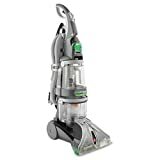 This Bissell BG10 Deep Cleaning Carpet Extractor model comes in a kit that includes the deep cleaning machine, an upholstery tool kit, and a bottle of high quality Bissell Multi-Use cleaning shampoo. The unit features two high-performance and reliable motors—one for producing suction power while the other is for rolling brush. For cleaning dusty and heavily stained carpets thoroughly, this is the machine you need. Its removable clean and soiled water tanks system integrates flow indicator light for tracking the water and also solution levels, adding to the user convenience. The machine is simple to use thanks to its rounded handles for a convenient grip and greater control. It comes with a new design upholstery tool and hose for cleaning hard-to-reach parts more easily. The Lite II by Mytee Mytee is a powerful Carpet Extractor with a stylish look and top quality performance and ease of use. It has a compact design that, with 2 never-flat wheels and a luggage-style handle, becomes very easy to carry from one spot to another. It also includes a reliably long hose and power cord, making it ideal for use cleaning carpets in big homes, offices and industrial spaces. It may look small, but Elite II holds up to 3-gallon water, which can work for over 3 hours cleaning. Other features to its efficiency include a 1000-watt in-line heater for consistent hot water supply, a 4-inch stainless steel upholstery tool, a 3-stage vacuum motor integrating a 130-inch water lift, and a limited lifetime warranty cover. Whether you are just a homeowner or a commercial carpet cleaner, you must have a reliable quality carpet extractor, and the Aqua Power C4 could be the best for you. It is an American made model that looks as great as it performs. It features an adjustable handle that allows you to custom set the height position that best works with you, and also has large wheels for convenient, effortless maneuverability, control. Such features make this machine quite user-friendly since anyone, even novice carpet cleaners will be able to get around without much strain. Moreover, the Aqua Power C4 has highly effective rotary brushes that help clear even the toughest carpet stains a lot easily. Other features include a 4-gallon removable water bucket and detergent solution tank. It is a durable model made of heavy-duty cast aluminum, and stainless steel to last long and offer prolonged value. 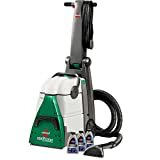 This BISSELL’s Big Green Series Carpet Extractor/Cleaner is a professional-grade model that is renowned for outperforming most of the available competing options. Powerful and durable motors, powerful suction and extra-large dirtlifter PowerBrush that effectively pulls out even deeply embedded grime are among its top features. It further feature 2 simple tanks for keeping the clean and the dirty water separate, ensuring easier clean up, reduced trips to the sink. 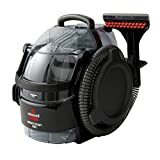 BISSELL BG 86T3 is made of high-quality and durable materials for a strong, anti-tip design, making it a robust and reliable unit top to bottom. It also comes with exclusive deep cleaning formula that integrates Scotchgard protection for protecting your carpets against future stains. Using the Mighty Pro X3 Pet Pack means you have all you need to keep your carpets clean. This is a carpet extractor kit that packs the best Rug Doctor’s deep cleaner for refreshing your carpets effectively. Its single pass cleaning, multi-directional high quality fiber brushes, the Mighty Pro X3 outperforms its competition by spraying, scrubbing gently but efficiently, and thus extracting the dirt and stains effectively off the carpet. It includes two proprietary cleaning formulas, one for a deep clean and doubles as a deodorant and the other for a quick clean. Both of these solutions have a pro-enzymatic property for deterring pets against remarking the carpets. 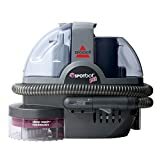 Also by Bissell, the SpotClean Pro id a compactly small but high-performance portable carpet extractor/cleaner that combines powerful, reliable vacuum suction, effective scrubbing action, and premium cleaning solution formula for professional carpet cleaning results. It excellently removes tough stains and stubborn stains. By design, it makes cleaning carpet, upholstery, auto interior, stairs and more a breeze. Its large 3/4 gallon tank holds enough water to clean a wider area without the need to empty or refill. Moreover, a long 33-ft power cord ensures users have the convenience of reaching wider area at once and also those hard-to-reach spots. It comes with unique premium-quality cleaning formula for giving your carpets a deep-down clean, while the contained Scotchgard deters future pet staining. One of the more popular, greater efficiency carpet cleaners/extractors, the Hoover SteamVac Widepath boasts proprietary SpinScrub brushes for cleaning all sides of your carpet fiber. These brushes are easily removable for hassle-free clean up. The machine integrates three speed settings for performing various tasks, while its dual-V technology offers even suction power over the entire cleaning path, removing more water and dirt from the carpet than other models can. Thanks to a robust 12-amp motor, the Widepath delivers 20 percent greater carpet brushing, cleaning action. Its heat feature applies effective heat directly to your carpet for a more efficient action and more desirable results. It also includes an 8-inch hose for ensuring longer reach and a tool caddy to ensure convenient storage. Also included is a SpinScrub hand power crevice for above-the-floor cleaning duties. An automatic detergent mixer and well positioned intuitive controls add to user convenience. With a simple push of the button, the Bissell’s SpotBot Pet provides proper hands-free stain and spot removal on your carpets and other area rugs. This incredibly popular carpet extractor features 2 pre-programmed cleaning cycles. It is a portable unit that automatically sprays and then brushes and suctions to get rid of both surface stains and tougher, embedded stains. It has a special cleaning foot that integrates DeepReach technology, delivering water and the cleaning formula deeper into the carpet fibers before scrubbing. This ensures remarkable stain removal for an excellently cleaned carpet. An included hose and tough stain tool add to the versatile and extended reach performance of this machine. You probably have tried your own search for a carpet extractor and have seen for yourself just how overwhelmingly many of them the market has to offer. That, as mentioned earlier, is the case that many persons find themselves in, not knowing clearly the right carpet cleaner model for their needs. To avoid after purchase regrets, it is good to ensure that you go for the best value product with high performance efficiency and lasting clean results. You can never get it wrong with your favorite from among the above reviewed 10 best carpet extractors in 2019.